This is the second release from the author (SP_Moabit) and in this one he really improved his mapping experience. There seems to be no storyline and looking through the web over St eugene match 6 differents villages all over France. It seems, looking at the end map message, that this St Eugene is located near Falaise in Normandy . 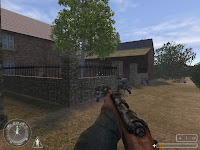 First of all Sturmgoat decide to change the 'point of view' and will make through his release act like a german soldier who try, with is small team, to take back a small village protected by well hidden allies forces and after reach the rest of their team at the outskirt of the village. Design is for me well done and architecture look realistic (the way you need to progress is also well put together using walls, bushes and military equipment to 'force your progression'). The only things that bother me a little after playing the map was that it looks to calm for an ocupied village (with birds singer under heavy fire), the use of german halftrack for orienting you progression is also a little confusing (in an allied occupied village) and finally the lack to anime vehicules and events (which is not a pieces of cake to manage in mapping/scripting) certainly hold the realism of this release to be nearly perfect. 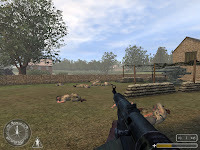 For the rest, you will encounter a lot of variation through the map according use of terture, situation and buildings. It still doesn't provide totally visitable place (ex would have been great to get in the top of the church and use the MG42 against 'enemies') but it is certainly realistic enough. Gameplay is in my opinion (like in his first release) too challenging and need a lot of precision, especially using the kar98 in order to not waste time, munitions and health (need 3 to 5 hits to kill an 'enemy' except if you hit him directly in the head). The lack to changing weapons (kar98 and MP40-in the middile mission), except close to the end, is also frustrating and makes the all experience quite challenging to even unbeatable (MG42 at the outskirt of the village). After this MG42, (I needed sadly to cheat to pass this point) you will reach a sort of farm with an artilery canon where you will get back to the rest of your squad and be prepared to some more thaught ambushes that provide, in the bulding, some other weapons. The scripting is well handled to make all entitites move in the right place but will lead to some quite buggy events (perhaps due to my config) in several part especially last one where a lot of runtime errors occured. In conclusion: Sturmgoat has increase a lot is mapping skill through the last two years and provides us a well krafted experience that only disapoints me through the challenging or should i say frustrating gameplay. Hope the author undestand in the future that it could make a more challenging mission just by pushing fight and enemy placement (Yorkshire Rifles releases but certainly without making them super soldiers!